Beautiful Autumn trees in Algonquin Provincial Park in Ontario, Canada show off their colors against the white billowy clouds floating above. The beautiful colored Autumn leaves atop the trees at the West Gate in Algonquin Provincial Park in Ontario, Canada, prominently stand out against the white billowy clouds passing by. Some of the trees try to hold onto their green summer leaves but nature takes over as the seasons change, preparing the trees for the Ontario winter which lies ahead. Fall colours at the West Gate of Algonquin Provincial Park, Ontario, Canada. 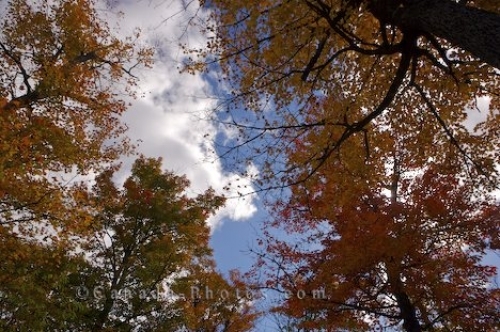 Picture of the soft white clouds and the beautiful Autumn colored trees in Algonquin Provincial Park in Ontario.